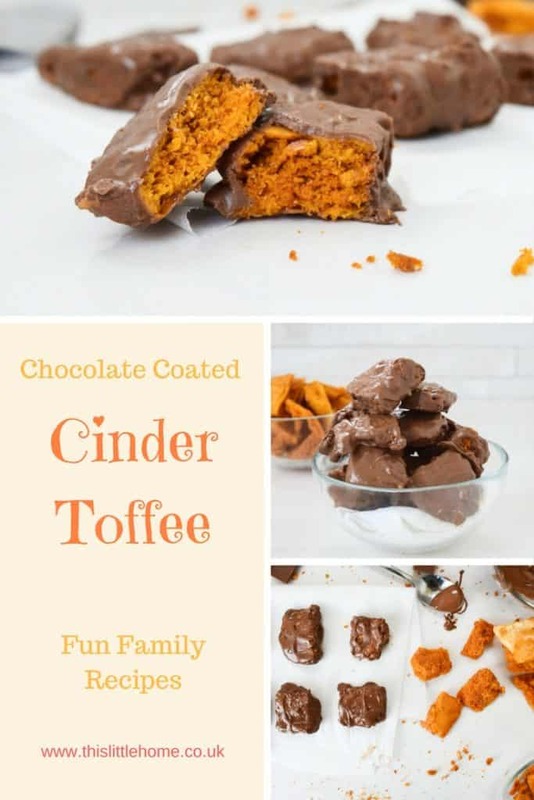 Cinder toffee makes me feel so nostalgic. As a child, with my pocket money in hand, I would head to the local newsagent and buy myself a Beano comic and a bag of penny sweets. Along with sherbet filled flying saucers, cinder toffee would always be at the top of my list. You only need 4 ingredients for this recipe and its quick to prepare. You just have to wait for the chocolate to set….. If you can resist! 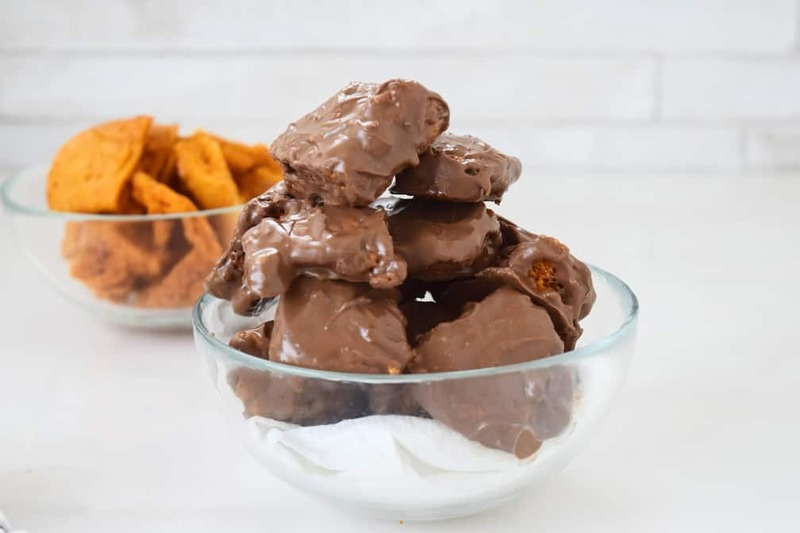 It’s the weekend and a perfect time to create some delicious chocolatey treats with the boys. I think they probably got more chocolate on themselves than the cinder toffee. But they enjoyed it and I totally enjoyed eating the result! 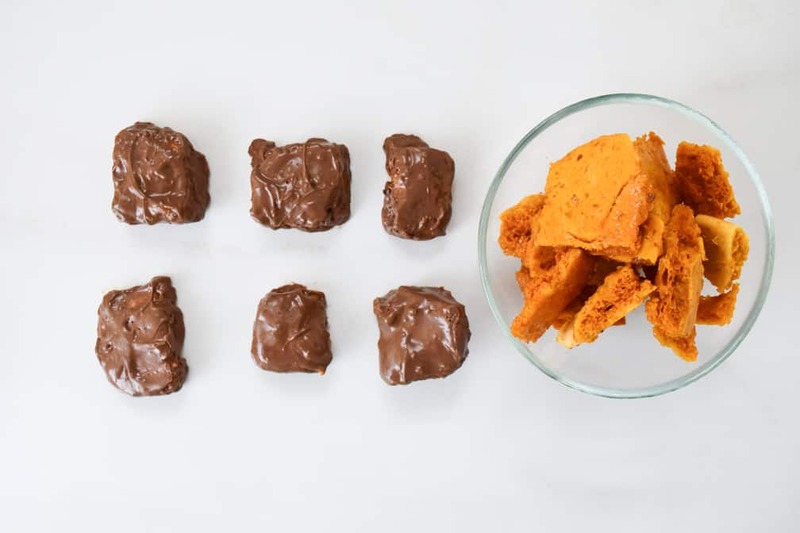 The secret to making the perfect cinder toffee is getting the mixture just right before you add the bicarbonate of soda. Yes, you can get technical and use a sugar thermometer, there’s nothing wrong with that at all but I find once it begins to really bubble take it off the heat and quickly whisk in the bicarbonate of soda. Then comes the fun but most important part! The mixture will foam up like a volcano erupting, be careful when you tip it into your tin, do it gently whilst it’s still rising up to keep the bubbles in the mixture. The more bubbles that stay in place the better the result, you will find it a bit solid and hard if the mixture goes flat. 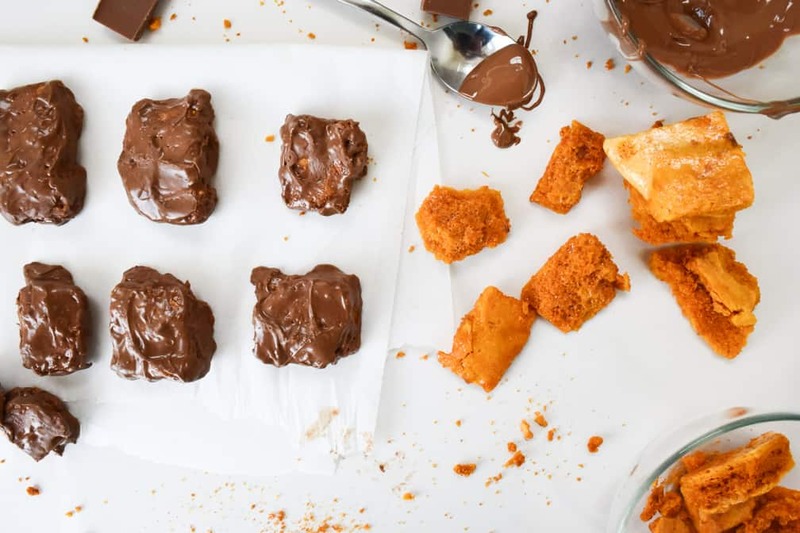 Leave your mixture to set, then you can break it up into bite size pieces and then cover your cinder toffee in the melted chocolate. If you’re looking for more recipes that will transport you back to your childhood give these homemade Party Rings a try. What’s your favourite nostalgic treat? Share with me in the comments. 200g Milk Chocolate to coat. Firstly, grease a 20cm Square tin with vegetable oil and measure out the bicarbonate of soda. Place the sugar and syrup into a heavy bottomed saucepan. Let the sugar melt into the syrup over a gentle heat, stirring only occasionally to prevent sticking. Once the sugar has dissolved, turn up the heat to medium and leave to bubble without stirring until the mixture turns a little more golden, it shouldn’t take longer than a couple of minutes. Take off the heat immediately and quickly whisk in the bicarbonate of soda, it will bubble up at this point. Do not whisk for any more than a few seconds. Pour the mixture carefully and gently into the middle of the oiled tin, Allow to spread by itself without touching it and let it cool and harden. Once the cinder toffee has hardened, using a sharp knife, cut it up into small pieces. Grease a piece of baking paper and lay it on a baking tray. 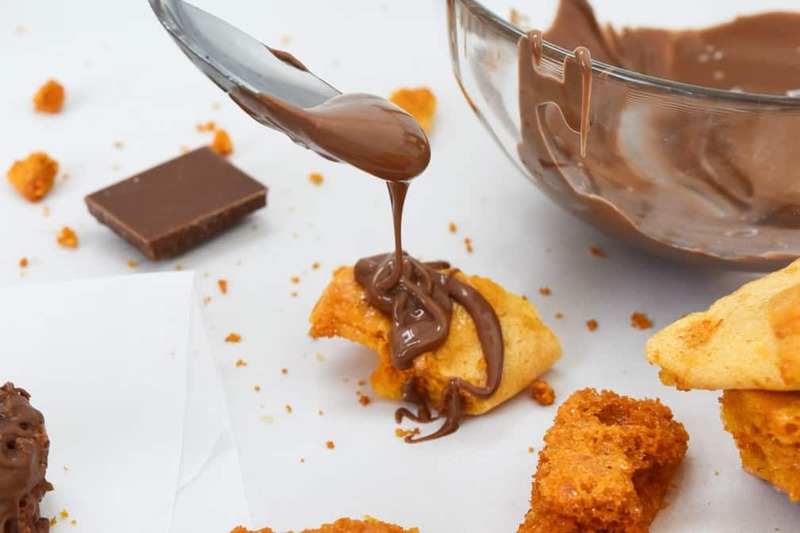 Melt the chocolate and coat each piece of toffee in it, lay each piece on the baking paper and allow to set.